Kings Head in Yoxford serves real ale. The pub is a member of Cask Marque. 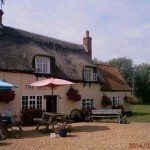 Thatched village local with a single traditional bar & a separate dining area. Gravity beer is still served from a back bar. The huge garden leads down to a small stream & unspoilt meadows.